Support many devices including iPod, iPhone,Apple TV, PSP, PS3, Xbox, Mobile Phone, BlackBerry etc. Adding watermarks on videos.Adjust the video’s brightness, contrast, saturation and exposure.Trim any video segment by setting the Start time and End Time. Extract audio from video,capture pictures from video. Cute Screen Recorder Free is a easy-to-use screen recorder software. It is able to record the action and sound from all screen activity on your computer and saves it to mp4,flv,swf , wmv ,lossless AVI , mkv and webm video files. Cute Video Audio Merger Free can merges audio and video file into a single video file. Cute Video Watermark Free can add watermarks on videos.. Cute FLV Streaming Video Free is a easy-to-use video streaming software. It can help you post video files to website or BLOG with clicks. Cute Video to GIF Converter Free is a freeware which can convert video to gif animation simply and fast. Cute Video Cutter Free a free easy-to-use video utility to help you to cut and split your video files into small size.It can cut large video file and remove unwanted parts. Cute Photo Slideshow Free is a easy-to-use photo to video slide show software. which can convert photos to wmv,swf, flv, mp4 and mov video format. Cute Video Dub Free trim any video segment by setting the Start time and End Time. Lets you delete unwanted parts from video files without re-encoding. The program preserves the quality of input video files and processes them without re-encoding. Cute Video Dub Free is lossless video editing freeware! 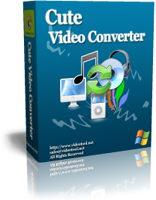 Cute Video Converter Free is a easy-to-use video converter software. It can convert many video formats, e.g. DivX, XviD, MOV, MPEG-4,MPEG, WMV, H.263,AVI,WMV,ASF to the others Video format MPEG-2,MPEG-1,FLV and AVI etc.